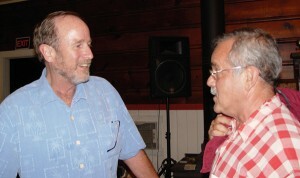 Water advocate Tom Stokely, left, discusses water policy with Lincoln Kaye after a presentation at Northern Delights in Hayfork Sept. 18. Posted: Wednesday, September 26, 2012 6:15 am | Updated: 7:46 pm, Tue Sep 25, 2012. The Bay Delta Conservation Plan with its proposed twin tunnels to get water past the Sacramento-San Joaquin River Delta threatens the Trinity River and Trinity Lake and will not even help fish in the Delta as promised, a longtime Trinity River advocate said. About 35 people gathered Sept. 18 at Northern Delights in Hayfork to hear Tom Stokely's take on the state and federal plan unveiled July 25 by Gov. Jerry Brown and U.S. Interior Secretary Ken Salazar. "This is like going to a contractor and saying I'd like you to build me a house. I have no financing. I have no plans. I have no permits but I'd like you to do it," said Stokely, former natural resources planner for Trinity County and now a director for the California Water Impact Network. Stokely is scheduled to speak to the Trinity County Board of Supervisors on the issue the morning of Oct. 3. A draft environmental impact statement and report on the project known as the BDCP is being prepared. Among the main beneficiaries of sending more water south of the Delta will be the 600,000-acre Westlands Water District and the San Luis & Delta-Mendota Water Authority, Stokely said, calling them 800-pound gorillas with resources to hire the best attorneys and lobbyists. 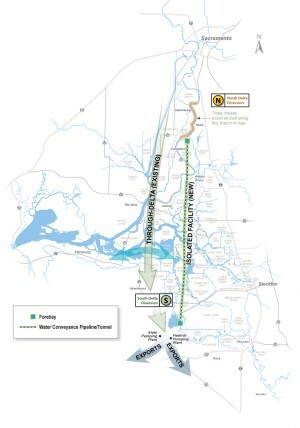 The two proposed tunnels – each 33 feet in diameter – would take water under the Delta, an inland estuary through which water from the north, including diverted Trinity River water, is pumped to get to farms and cities in the south. The pumps can grind up fish and displace them by causing the San Joaquin River to flow backward. As a result, there are restrictions on that pumping. In addition to alleviating that problem, the tunnels are also billed as a way to prevent interruption of water deliveries in the event of a levee failure in the Delta. The plan is estimated to cost about $24 billion, including $14 billion for construction of the tunnels to be paid for by water users and $10 billion for habitat restoration in the Delta to come from taxpayers. A water bond to pay for some of the restoration is set for the November 2014 ballot. A similar project Brown pushed for – construction of a peripheral canal – was rejected by voters in 1982. Stokely shares the concern of many North State residents that relieving the bottleneck caused by the pumping restrictions will open the spigot wide to send even more water south. That could happen to the Trinity River in spite of the 2000 Trinity River Record of Decision that gave the river about half its water back and set specific flows down the river based on water year type, Stokely said. Under the Record of Decision, releases to the Trinity River are to average 594,500 acre-feet but Stokely pointed out that the federal Bureau of Reclamation has water rights for the river that would allow minimum flows well below those figures at 120,500 acre-feet. That leaves 474,000 acre-feet of what Stokely calls "paper water." "When we go into a multi-year drought Trinity Lake will basically be emptied," Stokely said, adding that one of the few benefits Trinity County gets from construction of the Central Valley Project's Trinity River Division is low-cost power. "Even that is threatened by draining Trinity Lake," he said. In a telephone interview, Bureau of Reclamation BDCP Program Manager Federico Barajas in Sacramento said, "BDCP is not about getting additional water. It's about changing the configuration by which the water gets conveyed through the Delta … It is to have a more reliable water supply mechanism in place." Another aspect of the plan is habitat restoration, he said. As yet unanswered is the amount of water available for Delta exports after completion of the project, or if those exports will increase. "We're in the midst of trying to figure that out," Barajas said. "We're continuing to honor the Trinity Record of Decision of 2000 flows as a foundation to the BDCP modeling," he said. "We're not planning to make any changes or adjustments to what you have seen in the past." While the scale of the new facilities has been downsized from transporting 15,000 cubic feet per second of water to 9,000 cfs, the current system could still be used as needed. "It's a dual facility," Barajas said. "It allows additional flexibility." There are many reasons not to believe what proponents of the plan say, Stokely said, from the price tag to the benefits. Legislation for a cost benefit analysis was killed, he said, but an independent estimate from the University of the Pacific's business forecasting center found that for every $2.50 spent, $1 in benefits would be realized. Although a firm figure as to what Delta water exports would be if the plan is implemented has not been provided, earlier figures put forth raised concerns from scientists saying the plan will hurt species – not help them. Planners who say otherwise -- "they're just flat-out lying," Stokely said. There are other solutions to the problems in the Delta and water shortages, Stokely said, including improvements to the levees, recycling and storm water capture. Asked how the plan can be stopped, he suggested that residents talk to their county supervisors asking for a resolution opposing it. And, he said, residents with friends in the cities who get their water from the Delta can ask that they tell their water boards they don't want this project.